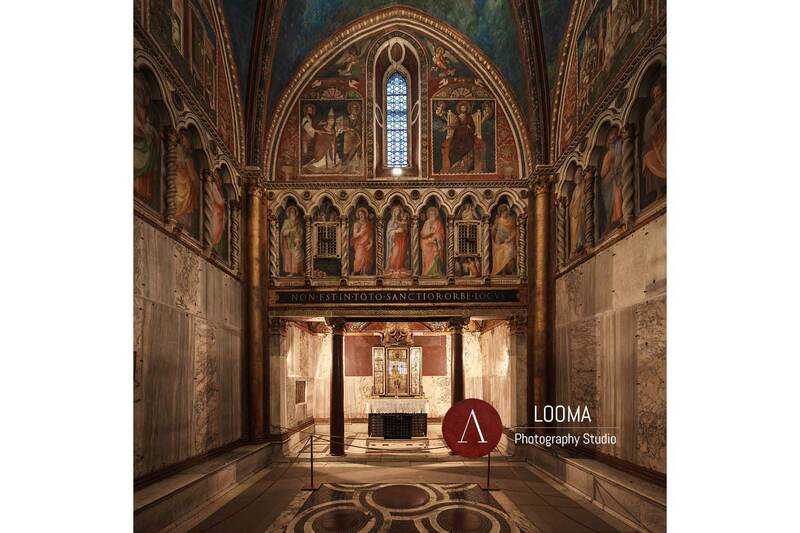 Case Study: Photographs of the new lighting installation of the Church and Chapel of San Lorenzo in Palatio, Pontifical Sanctuary of Holy Stairs (Scala Sancta), in Rome, Italy. 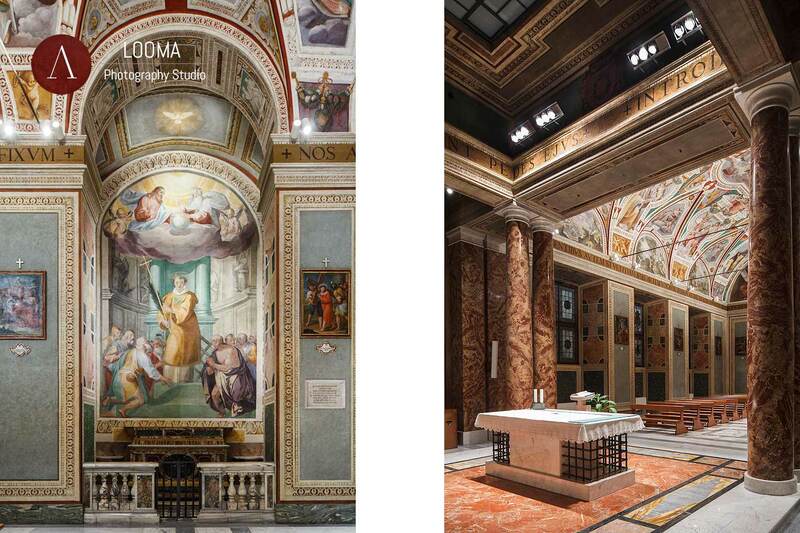 The client – iGuzzini Lighting – needed a faithful representation of both the interior architectures and the frescoes, lit by their lighting system. 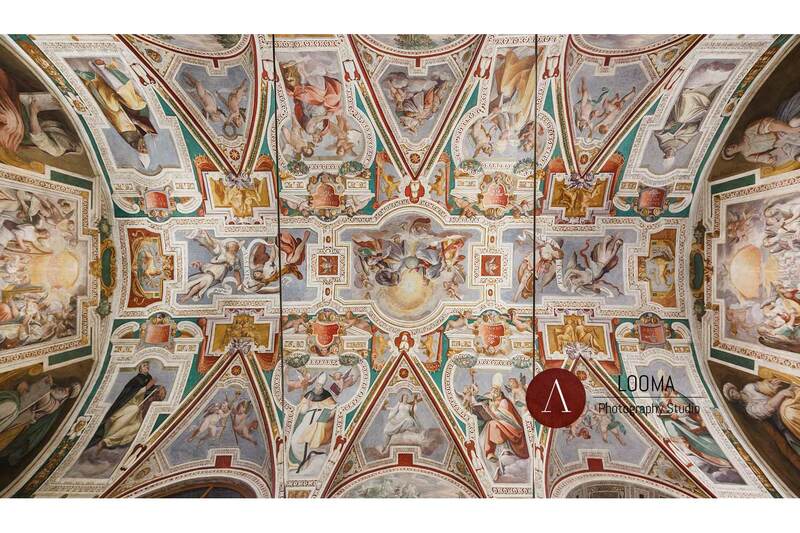 They have been just restored with funds from the Getty Foundation and Vatican Museums coordinating the effort. 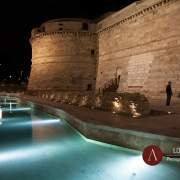 iGuzzini innovative installation has been designed in order to increase the value of the notable restoration works and cultural assets. Photos of the illuminating device mounts (mostly LED wallwashers, floodlights and spotlights) were also required. 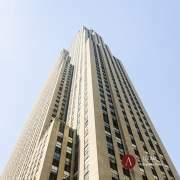 A preliminary survey of the location highlighted the need for operating nighttime for most of the photographs, in order to avoid cold skylight radiation pollution and get uniform tone balance for the works of art in place. A perceptual approach has been preferred against a strict numerical color workflow, this latter more suitable for out-of-context art reproduction. The intent was indeed to render the visual impact of the lighting system and how it is overall perceived by the visitors in place. The night operation was authorized by the rectorate of the sanctuary. It has been a privilege and an experience to move at night in such a venerated place. 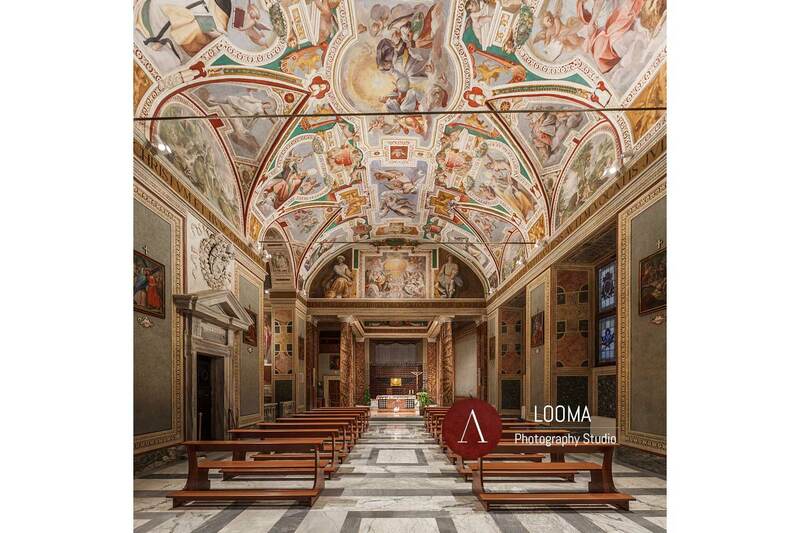 The spaces of the main nave of the church – dated 1589 A.C. – presented a number of asymmetries and misalignments between the main barrel vault, the lunette coves, tie bars and pavement that challenged the shooting. The chapel of San Lorenzo in Palatio – the Sancta Sanctorum in Rome, Italy (date undetermined -first mention is in 772 A.C.) is the core architecture of the sanctuary and houses some of the most venerated relics of Christianity. It is placed on top of the 28 marble steps of the Holy Stairs, a destination for a multitude of pilgrims from all over the world. The chapel is presently still illuminated with old generation lighting devices and the photo taken of the main interior elevation will serve to keep track of the pre-renovation state and it will be used as a reference for comparison with the new condition, when completed. The planar projection of the main elevation of the Sancta Sanctorum has been achieved through a mixed technique. The limited operating space, imposed both elevating the plane of film and shifting the optics all the way upwards. Eventually, shifting down and re-centering the optics with a precision slider plate, allowed to shoot other parts of the scene. References have been recorded in order the get later a matching projection, waiting for the new lighting system to be installed and ready to operate. Pre-renovation state – Elevation planar photograph of Sancta Sanctorum Chapel – Sanctuary of the Holy Stairs. Restoration begun in 1995, when 17th century paintings were sacrificed in order to uncover the 13th century frescoes underneath. Lighting is old type and waiting for a new project to be completed. 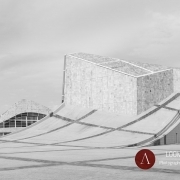 Photo: Riccardo Budini / Looma for iGuzzini Lighting s.p.a. The nave of San Lorenzo in Palatio church. 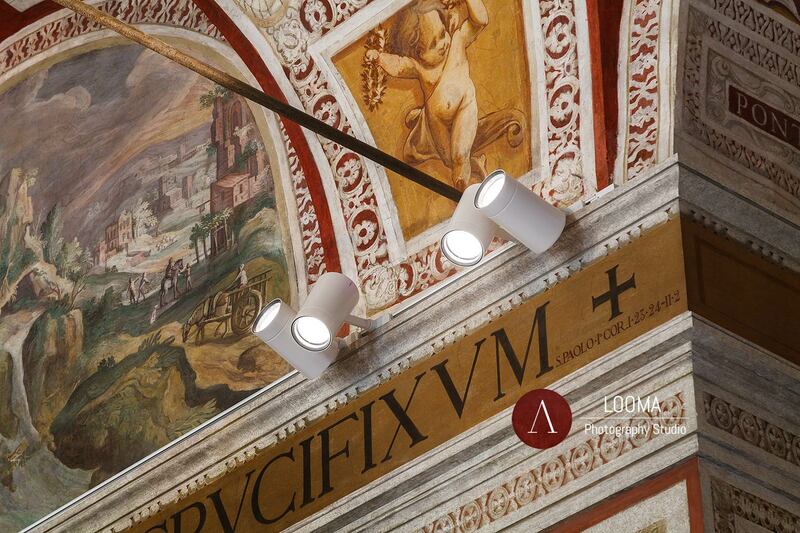 The frescoed ceiling vault and the structures were just restored with Getty Foundation funds and illuminated by iGuzzini LED lighting system. The frescoed ceiling vault (17th century) of San Lorenzo in Palatio church. 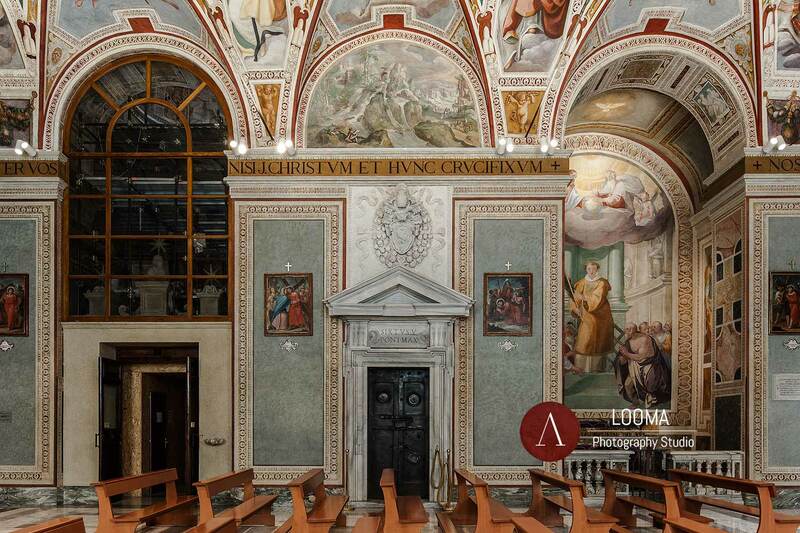 Restored with Getty Foundation funds and illuminated by iGuzzini LED lighting system.The central panel depicts The Glory of the Trinity, and the eight panels on the springers depict Doctors of the Church. Planar photograph of the interior left hand elevation of the San Lorenzo in Palatio church. The near and far bays on the left hand side are occupied by tall arches, which incorporate the lunettes here and break the entablature. The pedimented bronze doorway in the middle bay leads into the Sancta Sanctorum. 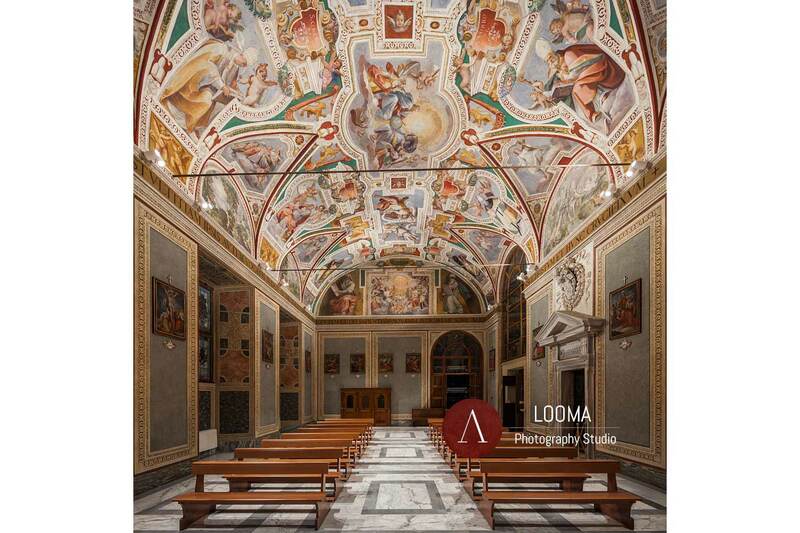 Photo: Riccardo Budini / Looma for iGuzzini Lighting s.p.a.
Chapel dedicated to San Lawrence. 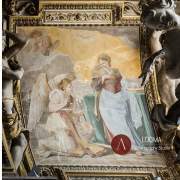 Here is an altarpiece fresco depicting The Apotheosis of St Lawrence possibly by Croce [L] – Separate sanctuary of the same width as the main nave but with a lower ceiling, which was re-fitted in the late 20th century by the Passionist architect Ottaviano D’Egidio – Photo: Riccardo Budini / Looma for iGuzzini Lighting s.p.a. Detail of the LED lighting focus fixtures that cast accent light on the altar area, a former separate sanctuary wth a lower ceiling. Church of San Lorenzo in Palatio – Rome. 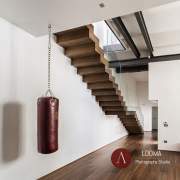 Photo: Riccardo Budini / Looma for iGuzzini Lighting s.p.a. Detail of the LED floodlights fixtures that shed light both upwards, on the frescoed barrel vault, and downwards, on the faithful benches. Recessed tracks are well hidden behind the entablature. 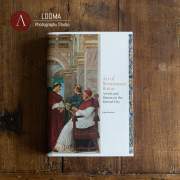 An even illumination is paramount for large frescoed surfaces. Church of San Lorenzo in Palatio – Rome. 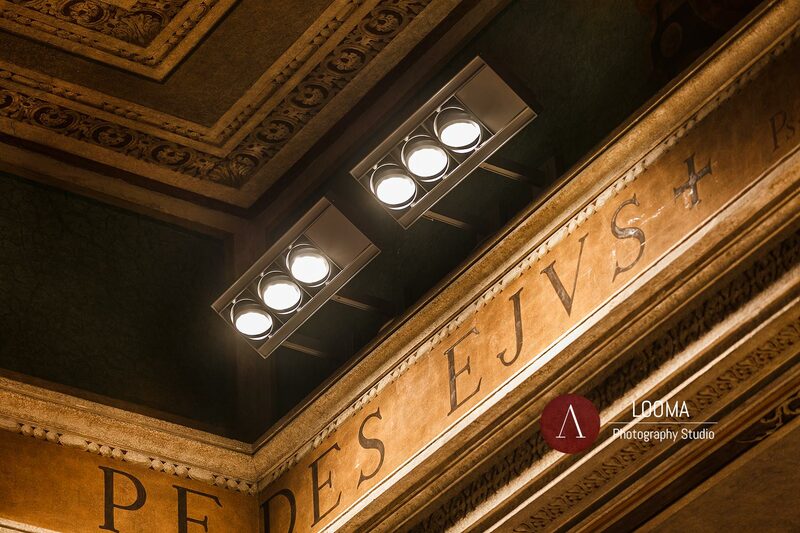 Photo: Riccardo Budini / Looma for iGuzzini Lighting s.p.a.